USA: Allstate has launched a usage-based insurance app for smartphone users. Available for free download through iTunes or Google Play, the new Drivewise app offers near real-time updates with each trip and provides easier access to customers on the go. 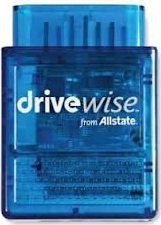 Drivewise provides constant feedback to drivers through a website designed to help identify and improve driving habits. Drivewise measures things such as mileage, braking, speed, and time of day when a customer is driving. Using that data, Allstate calculates a discount for each customer using its telematics technology. Employing advanced telematics technology, Drivewise plugs into the on-board diagnostic port found under the dashboard/steering column to track driving behavior. Participants can easily plug in the small, wireless telematics device, and then go online or use the new smartphone app to learn about their habits behind the wheel and identify what they can do to become safer drivers. The web portal and app also display the potential performance discount a customer may be eligible for based on their driving habits, so drivers can constantly connect the way they drive with how much they can save. Rates will not go up based on driving scores, but savings of up to 30 percent can be earned by drivers with the safest driving scores and lowest mileage.